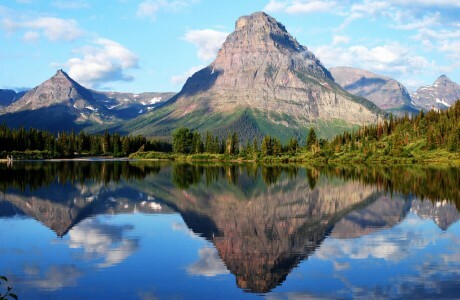 West Glacier, MT – Glacier National Park will continue evaluation and work on the Many Glacier Road this year. The roadway was originally built between 1927 and 1931 and, according to the 2007 National Park Service (NPS) Cycle 3 Road Inventory Program, is in a “fair to poor” condition. The roadway surface and parking infrastructure at the Many Glacier Hotel have significant asphalt cracking, rutting, potholes, and some slumping—all of which indicate inferior road base material. In addition, there are numerous active slide areas that intersect with the road. Last year the park used a durapatcher donated by the Glacier National Park Conservancy to temporarily fix some significant potholes that caused motorists difficulty. The park in partnership with Federal Highways Administration (FHWA) is also piloting a horizontal drain system to evaluate drainage solutions at some portions of the road that experience significant hydrologic issues. Minor work will continue this summer. Next year, the FHWA will begin rehabilitating other sections of the Many Glacier Road that are outside the horizontal drain areas. The project includes the road from Babb to the Swiftcurrent Developed Area in the park. A portion of the project is outside the park on the Blackfeet Reservation but within a NPS right-of-way. The FHWA, at the request from the park and the Blackfeet Fish and Wildlife, prepared a Wetland/Floodplains Statement of Findings in accordance with Executive Orders 11990 and 11988. The Statement of Findings determined that there would be no impacts on floodplains. Less than 1/10th of an acre of wetlands would be impacted inside the park and about .5 acres of wetlands would be impacted on the Blackfeet Reservation. To mitigate the impacts to wetlands, the park is preparing a project to restore wetlands on the Poia Lake Trail. FHWA is working with the Tribe to identify projects to mitigate the wetland impacts on the Blackfeet Reservation. A categorical exclusion will be prepared in accordance with the National Environmental Policy Act (NEPA) for the project. Road rehabilitation is covered by CE: 3.3. C. 9 “Repair, resurfacing, striping, installation of traffic control devices, repair/replacement of guardrails, etc., on existing roads. This CE also applies to road maintenance, rehabilitation, repaving and reconstruction on existing roads with the existing road prism. Actions taken under this CE may also include repair or replacement of culverts, signs, surfacing……” (NPS NEPA Handbook 2015). The impacts to wetlands does not rise to the level requiring an environmental assessment. As required by NPS policy, Glacier National Park is making this Wetland/Floodplains Statement of Findings available for public review and comment. It is available online at http://parkplanning.nps.gov/Manyglacier-SOF. The SOF will be available for public review for 15 days; comments are due April 2, 2019. If you require a hard copy of this 257 page document, please contact Mary Riddle at 406-888-7898 or mary_riddle@nps.gov to obtain a copy. Comments can be posted online at: http://parkplanning.nps.gov/ManyglacierSOF or sent by mail to Superintendent, Glacier National Park, Attn: Many Glacier SOF, P.O. Box 128, West Glacier, Montana 59936.